An overview of what happens on pre-op day to prepare for DBS surgery at Kaiser Permanente, Redwood City. July 11, 2013 | by Darcy Blake | Yesterday was my pre-op day at Kaiser to prepare for DBS surgery next week with Dr. Mark Sedrak. It seems as though Kaiser must employ experienced flight controllers to book their surgery appointments because the five appointments that the nurses lined up for my pre-op day were so perfectly synchronized, I flowed from one appointment to another without a hitch. SFO airport should take note, because Kaiser knows how to work a schedule like clockwork! I started the day at Kaiser Permanente, San Francisco where I saw Dr. Rima Ash, my movement disorder neurologist. She will program the implanted neurostimulator device a couple of weeks after my surgery. This was a check-in visit to see if I had any questions about the procedure. She also walked me through the first couple of weeks so I could get an idea of what to expect. I hope she doesn’t think I am shallow, because the only question I thought to ask at the time was would I be able to wear my jewelry with magnetic clasps. [Yes.] And now that I’m thinking about it, how long must I wait before I can tint my hair? That is, after my hair grows back, because my head will be shaved for the operation. These are the questions a woman needs to know! Hairstyling and jewelry! After Dr. Ash, my next appointment was at Kaiser Permanente, Redwood City with Ivan Bernstein. He works in Functional Neurosurgery and Pain Management at Kaiser Permanente. He and Diana Bruce, to whom I was also introduced, are physician assistants. They do the pre-op exams, and assist the surgeon during surgery with mapping, and planning the DBS. They are also into humanitarian volunteering. Diana spent the year of 2011 in Iraq and Ivan is planning on a trip to Vietnam as part of a neuro-surgery team that will do surgeries there. Their duties at Kaiser are along the lines of wedding planners making sure that every detail of the surgery is planned to perfection so that the “marriage” between patient and neurostimulator goes smoothly. 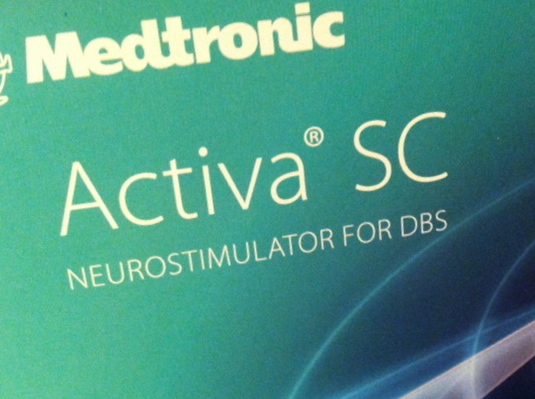 In my case, my union is with an Activa SC neurostimulator. What a catch! I had a choice of charged versus rechargeable neurostimulators, which have varying life expectancies. Neurostimulators eventually have to be replaced after 3 to 9 years, depending on the type you choose. Mine has a short life, but it will be easy maintenance, because I won’t have to recharge it every day. I took a poll amongst my friends when I was deciding on which style to choose, and they unanimously agreed that technology is bound to change. Maybe something will come along that is better. So with those statistics, I decided for the no-fuss, short-life variety. Anyway, I’m bad with cords and plugs. After Ivan, I met with Dr. Quesada, who practices physical medicine and rehabilitation at Kaiser. He is a nutrition and exercise specialist. I enjoyed chatting with him so much, I could have gone on for hours comparing diets and exercise techniques. But, I had to move along so I would not be late for some blood work and further testing by Dr. Alexander Yu, an internist who works closely with the surgeon to determine if the patient can safely proceed with anesthesia and the planned surgery. After a review and the blood tests, the kind nurses gave me a bag to hold my armful of business cards, flyers, instructions, and other information that I had collected throughout the day, and I stopped by an office to sign some paper work, and to pick up the special wipes that I will use to wash my head and scalp the night before to prepare for surgery. While I was there Dr. Mark Sedrak, the neurosurgeon popped in. He will implant my device under the skin in the chest, and thin, insulated wires called “leads” will be implanted within my brain and then connected to the device. The medical device is similar to a pacemaker and it will send electrical stimulation to precisely targeted areas of my brain. Once my brain gets a nudge from this stimulation, it will get the message that it is time to shape up and function like a normal brain. I love that Dr. Sedrak took the time to say hello. A special family atmosphere exists in Neurosurgery at Kaiser, and I feel very fortunate that I’m having my surgery with the kind and caring medical team there. The next stop was my MRI appointment, and who should I run into on the way in, but Dr. Eric Sabelman, the bioengineer. He supervised my MRI to make sure that the pictures were just what he wanted for the surgery. He has the look of a scientific genius from the days of Socrates. Rumor has it that aside from his scientific brilliance, he is the music director in the surgery room. His classical music selection is said to be superb. As long as he doesn’t throw in a bunch of Czerny, it will be a nice distraction to hear his playlist. Altogether, the MRI takes about 40 minutes. I know some claustrophobic types dread the MRI. I am plenty claustrophobic if throw into the Lake Shasta Caverns, but MRIs don’t bother me that way. The loud noise is not pleasant, even with the earplugs you receive before hand, and a couple of the shots take 17 minutes each of pounding drill noise. But I distracted myself by making up mental melodies to lay over the atomic gun base of the MRI machine, and it was actually tolerable by doing that. This is a time when musicians can draw on their creative musical skills. People like my brother, a new wave synthesizer musician in New York would probably jump at the chance to transform MRI noise into an album. After my MRI was finished, my pre-op day was done, and now all I must do is chill until the day of surgery next week. Pardon me, but you’ll find this blog will be a little quiet next week during and immediately after my surgery, but I’m hoping for a quick recovery so I can get back to blogging about my friends in Parkinson’s Women Support and the wonderful resources that we have to keep ourselves moving and dining together. Best of luck with this Darcy! Sending you quiet wishes for a very smooth path. Thanks, Marlene. I’ll be inspired by your stamina as an athlete as I get back in shape after the surgery!